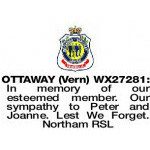 A private Cremation for the Late Mr Vernon Stewart Ottaway, former Mayor and Freeman of the Town of Northam (WX032225 28th BATT AIF) will be held in accordance with his wishes. 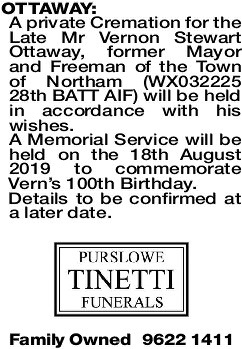 A Memorial Service will be held on the 18th August 2019 to commemorate Vern's 100th Birthday. Details to be confirmed at a later date. 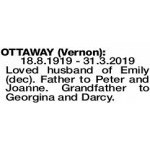 18.8.1919 - 31.3.2019 Loved husband of Emily (dec). 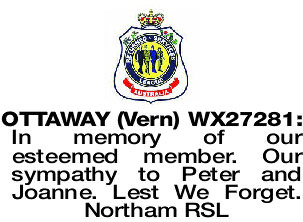 Father to Peter and Joanne. Grandfather to Georgina and Darcy. 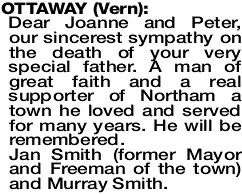 Dear Joanne and Peter, our sincerest sympathy on the death of your very special father. 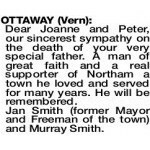 A man of great faith and a real supporter of Northam a town he loved and served for many years. He will be remembered. Jan Smith (former Mayor and Freeman of the town) and Murray Smith.